Disparities in the use of school discipline by race, gender, and sexual orientation have been well-documented, and continue to place large numbers of students at risk for short- and long-term negative outcomes. 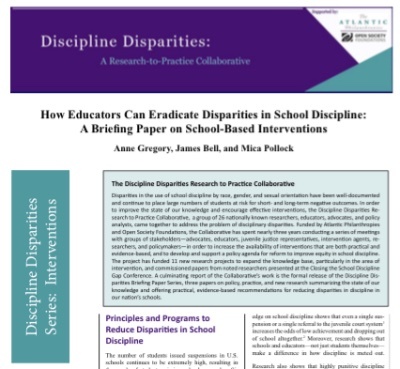 In order to improve the state of our knowledge and encourage effective interventions, the Discipline Disparities Research to Practice Collaborative, a group of 26 nationally known researchers, educators, advocates, and policy analysts, came together to address the problem of disciplinary disparities. Funded by Atlantic Philanthropies and Open Society Foundations, the Collaborative has spent nearly three years conducting a series of meetings with groups of stakeholders – advocates, educators, juvenile justice representatives, intervention agents, researchers, and policymakers–in order to increase the availability of interventions that are both practical and evidence-based, and to develop and support a policy agenda for reform to improve equity in school discipline. The project has funded eleven new research projects to expand the knowledge base, particularly in the area of intervention, and commissioned papers from noted researchers presented at the Closing the School Discipline Gap Conference. A culminating report of the Collaborative’s work is the formal release of the Discipline Disparities Briefing Paper Series three papers on policy, practice, and new research summarizing the state of our knowledge and offering practical, evidence-based recommendations for reducing disparities in discipline in our nation’s schools.